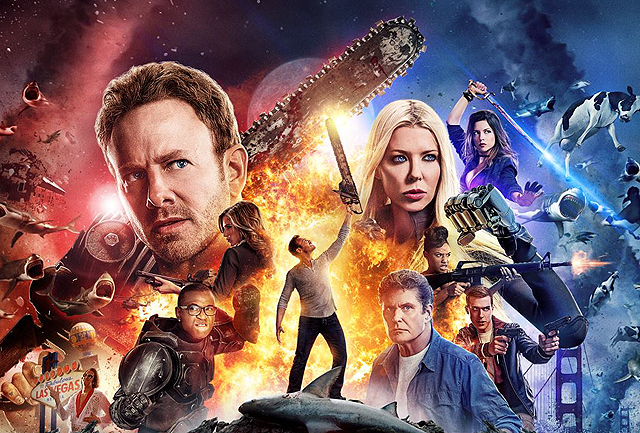 Sharknado 5, which sees the deadly weather phenomenon of shark-infested storms bombard cities around the world, will film in more than five countries, including the UK and Australia. Anthony C. Ferrante, who directed the first four films, is back to helm this latest installment, based on a script by Scotty Mullen. The original 2013 Sharknado film, which introduced a cyclone depositing man-eating sharks on the citizens of Los Angeles, became a worldwide phenomenon and spawned a pop culture franchise. In Sharknado 2: The Second One, New York City was the target of the disaster, and in Sharknado 3: Oh Hell No!, a mega-sharknado made its way down the “Feast Coast” from Washington, D.C. to Florida. In the most recent installment, Sharknado: The 4th Awakens, the shark-infested storms went national. The film ended with the Eiffel Tower ripping away from Paris and crashing down on Niagara Falls – a chilling indication that no one in the world is safe! Now, in Sharknado 5, with much of North America lying in ruins, the rest of the world braces for the inevitable – a global sharknado. Fin Shepard and his family must put a stop to this disaster before Earth is completely obliterated.